While browsing through the pages of this website will hopefully give you a flavour of who we are and the type of products which we produce, it is difficult for us to sum up our product range in a mere web site or even in a catalogue or brochure. The reason for this is that our product range changes everytime a customer calls into our workshops or picks up the phone to us. Of course we have off-the-shelf products a browse through our display products catalogue will illustrate some of these, however the true secret behind L.E. Graphics and what keeps customers coming back to us is the fact that we have the experience, skills and technology to develop signage solutions which are crafted to our customers individual needs – we will make a sign to meet your needs rather than try and shape your needs to fit our sign. We love to be challenged by our customers, nothing is more satisfying that seeing a finished sign or display solution that we have designed, crafted and installed to meet exactly with our clients needs. Contact us now and see if we can rise to your challenge! Whenever we answer a phone call from Sportsbowl we can be sure that our creativity and resourcefulness is about to be put to the test! This dynamic and forward thinking company is a long standing client of L.E. Graphics and we love the fact that they never tire of throwing new ideas and demands at us. The graphics needed to be modern and colourful but also something that would not grow tiresome in a few months. The panels need to be UV-Reactive, as part of some late night promotions, the bowling lanes are equipped with UV lighting and the normal lane lights are switched over to UV. Jim wanted the new graphics panels to make use of this and to take on a different appearance under the UV lights. Several basic design concepts were presented to Sportsbowl and once the final design was agreed upon we set about printing the graphics onto composite sheeting which could slot into the existing frames. Complimentary panels were then printed and fitted above the masking unit frames and the theme was continued onto the walls and even across the access doors beside the bowling lanes. Finally all of the graphics were highlighted with UV reactive inks which are invisible under normal lighting but strongly flourescent under the UV lighting. Panels were fitted accross all 16 lanes in each of the companies entertainment complexes in Ballymena and Glengomley. Another example of how Sportsbowl’s creative marketing has challenged our creative design and manufacture came a few years ago whenever they opened a new Restaurant in their Ballymena complex. 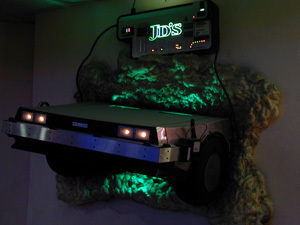 The restaurant was to be called JD’s and we were to produce a series of decor features based on the “JD” theme. First up on the wish list was a model of the Delorian car manufactured by John Delorian (JD) and made famous the Holywood blockbuster “Back to the Future”. We designed and produced from scratch a one third scale replica of the car, kitted out in it’s “time machine” accessories as seen in the film. 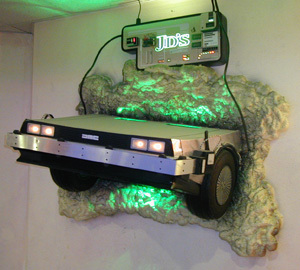 The model appears to be travelling through a “time portal – hole in the wall” and an electronic control panel features the JD’s logo.